Reknowned harmonica instructor David Barrett joined us last night all the way from San Jose, CA! David has transitioned from years of teaching Harmonica Masterclasses to offering instruction through his fantastic website, BluesHarmonica.com. It is a rich resource of educational materials based on transcriptions, videos, online lessons, interviews with the pros and more! Sign up and get your act together! David has also published some of the very best instructional books and if you missed out in the mad rush for them last night, they are available here: Books. Note that one of his recent books, Rock Harmonica, does cover fast lick playing as you'd expect, but David points out there is great info in there for the traditional blues player as well. It has good material on approaching soloing scales and also on playing over non-twelve bar songs. The more active you play, the softer you need to play. The more repetition you play, the louder you can play. Next up was an outline of chord tones for the I, IV and V. He built a chart on the board that empowers improvisational playing and horn line construction. He even pulled Al Nemcek up to demonstrate that two harps can easily play harmony horn lines (with variation on the spot) using this chart. Very cool! "If you want to add harmonica to a song, play the root. If you want to add to the song, play the third or the flat seventh." If you missed it, can't remember it or didn't get your camera pointed at the blackboard, everything he described and more is available in his book on accompaniment playing. Thanks for your time and expertise, David. It was an inspirational night in B1! 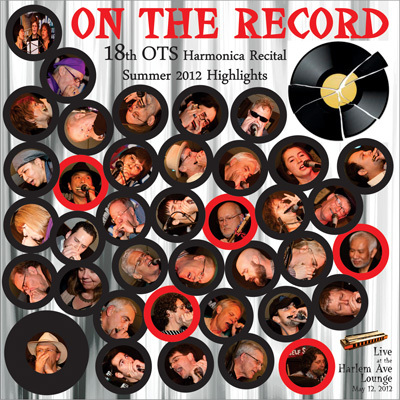 Bring your cash next week - the 18th Recital CDs will be for sale in class! Lots going on this week, both at the Festival proper and in the clubs around town. Here are a few harp-centric shows to catch. Full details as always on our calendar. Saturday at 4:00pm at the Windy City Blues Society stage, Harry Garner is hosting an "harmonica blowout". Saturday at 6:45pm at the Petrillo Music Shell B1's own Joe Filisko takes the stage to celebrate Muddy Waters disciples. Friday and Saturday nights at The Smokedaddy are hosted by Billy Flynn - lots of guests drop in and play at these shows, especially popular with harp players. Sunday at 4:00pm Scott Dirks and Dave Waldman host a blues fest jam at the Woodlawn Tap. Sunday night Morry Sochat & the Special 20s have Bob Corritore (and likely others) joining in to close out the festival.